Using named day delivery: Order this product within 8 hrs and 4 mins for guaranteed Tuesday delivery. 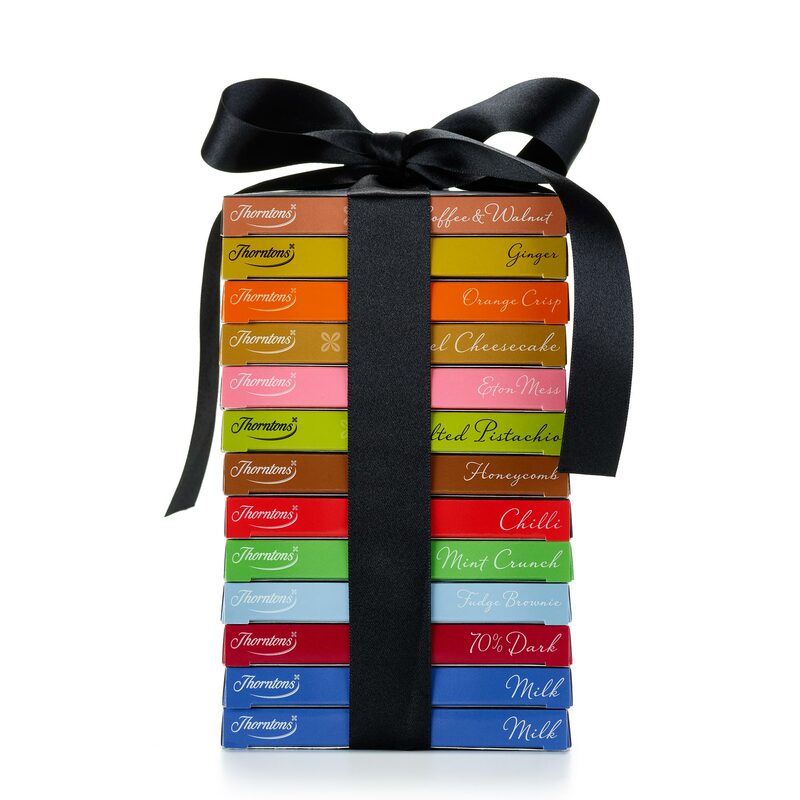 We’ve bundled together our deliciously chunky chocolate blocks to create stackable towers - a collection of our favourite flavours and a treat that’s ideal for gifting or sharing. 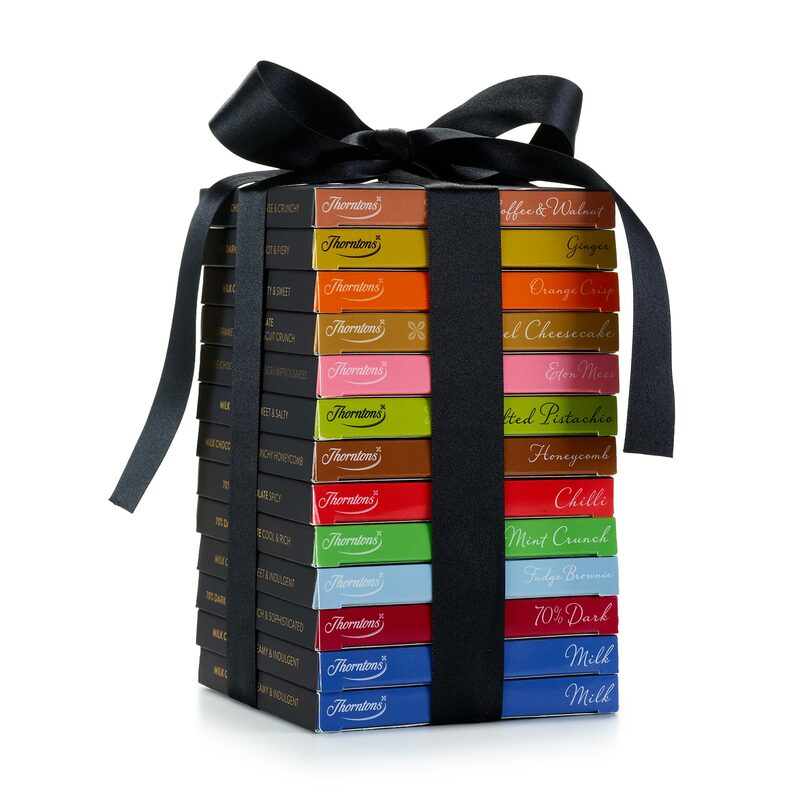 Our extra large tower contains thirteen chocolate blocks and is just as tempting to share with someone special or revel in a moment of indulgence for yourself. Combining sensational sweet treats such as velvety Fudge Brownie, crunchy Coffee and Walnut and fragrant Ginger alongside milk, dark and white chocolate delights, each of the thirteen chocolate floors has a flavour to enjoy. For nutrition information on the individual products contained in this tower, please view below. Sugar, Dried Whole Milk, Cocoa Butter, Cocoa Mass, Milk Fat, Emulsifier (Soya Lecithin). Sugar, Dried Whole MILK, Cocoa Butter, Cocoa Mass, Chocolate Fudge Pieces (4.5%) [Sugar, Sweetened Condensed MILK (Whole MILK, Sugar),Glucose Syrup, Palm Oil, Cocoa Powder, Chocolate (Cocoa Mass, Sugar, Cocoa Butter, Emulsifier (SOYA Lecithin), Flavouring), MILK Fat, Humectant (Glycerol)], Chocolate Biscuit Crumble (4.5%) [WHEAT Flour (contains Calcium, Iron, Thiamin, Niacin), Sugar, Palm Oil, Shea Oil, Fat Reduced Cocoa Powder, Rapeseed Oil, Salt, Raising Agent (Sodium Bicarbonate), Emulsifier (Sunflower Lecithin)], MILK Fat, Emulsifier (SOYA Lecithin), Flavouring. Dark chocolate contains: cocoa solids 70% minimum. Cocoa Mass, Sugar, Cocoa Butter, Fat Reduced Cocoa Powder, Emulsifier (Soya Lecithin), Flavouring. Sugar, Cocoa Butter, Dried Whole MILK, White Chocolate Coated Meringue Pieces (4.5%), [Sugar, Cocoa Butter, Dried Whole MILK, WHEAT Starch, Dried Skimmed MILK, Dried EGG White, Emulsifier (SOYA Lecithin), Flavouring, Glazing Agent (Acacia Gum), Glucose Syrup, Coconut Oil], Freeze-Dried Strawberry Pieces (1.5%), Emulsifier (SOYA Lecithin), Acid (Citric Acid), Flavouring. Cocoa Mass, Sugar, Mint Flavoured Sugar Pieces (7%) [Sugar, Colour (Chlorophyll), Flavouring], Cocoa Butter, Fat Reduced Cocoa Powder, Emulsifier (SOYA Lecithin), Flavourings. Cocoa Mass, Sugar, Cocoa Butter, WALNUTS (3%), Ground Coffee (2.5%), Fat Reduced Cocoa Powder, Emulsifier (SOYA Lecithin), Flavouring. Sugar, Dried Whole MILK, Cocoa Butter, Cocoa Mass, Waffle Pieces (3.5%) [Sugar, WHEAT Flour, MILK Fat, Lactose (MILK), MILK Protein, Salt, Malt Extract (BARLEY), Raising Agent (Sodium Bicarbonate)], Orange Flavoured Jelly Pieces (3.5%) [Humectant (Glycerol), Concentrated Apple Purée, Fructose-Glucose Syrup, Glucose Syrup, Concentrated Orange Juice, WHEAT Fibre, Sugar, Rice Starch, Palm Oil, Gelling Agent (Pectin), Acidity Regulator (Citric Acid), Flavouring, Antioxidant (Ascorbic Acid), Colour (Curcumin)], MILK Fat, Emulsifier (SOYA Lecithin), Flavouring. Cocoa Mass, Sugar, Candied Ginger (7%) [Ginger, Sugar, Glucose-Fructose Syrup], Cocoa Butter, Fat Reduced Cocoa Powder, Emulsifier (SOYA Lecithin), Flavourings. Sugar, Dried Whole Milk, Cocoa Butter, Cocoa Mass, Roasted Salted Pistachio Nuts (9%) (Split Pistachio Kernels, Salt), Milk Fat, Emulsifier (Soya Lecithin). Cocoa Mass, Sugar, Cocoa Butter, Chilli Infused Cocoa Butter (4%) [Cocoa Butter, Chilli], Fat Reduced Cocoa Powder, Emulsifier (Soya Lecithin), Flavouring. Sugar, Dried Whole MILK, Cocoa Butter, Cocoa Mass, Honeycomb Pieces (9%) [Sugar, Glucose Syrup, Palm Oil, Raising Agent (Sodium Hydrogen Carbonate)], MILK Fat, Emulsifier (SOYA Lecithin), Flavouring. Our Fudge Brownie Chocolate Block is perfect for enjoying while catching up on with TV, or sharing with friends and family. Mini fudge cubes and brownie pieces covered in our delicious milk chocolate. What is the definition of pure indulgence? White chocolate & simple scrumptiousness… creamy white chocolate with yummy mini meringue and strawberry pieces. For those who like their chocolate indulgently rich, dark and full of flavour, our master chocolatier has created this masterpiece using the very finest cocoa beans and 70% cocoa. Honeycomb pieces and flavours of honey combine to make this milk chocolate block irresistibly moreish. In this indulgently rich 70% dark chocolate block, the decadent dark chocolate melts away for you to discover an intensifying chilli flavour. Inspired by the famous coffee and walnut cake, this rich 70% dark chocolate bar is infused with an intense coffee flavour and complemented with crunchy walnut pieces. 14 melt-in-the-mouth pieces of chocolate form this 90g chocolate block, which is indented with the traditional Thorntons logo. With strong coffee aromas this block is perfect for melting, using in baking and giving as a small chocolate gift for coffee lovers. Refreshingly crispy mint wrapped in sophisticated 70% dark chocolate. The perfect little treat for him to indulge himself. This chocolate block is so good, they might not want to share it. This truly special Milk Chocolate Block is rich and creamy and made with the finest milk chocolate. Perfect for indulging yourself after a busy day at work, or for sharing if you're feeling generous! Rich 70% dark chocolate paired with fragrant ginger with a delicious sweet finish. Each bite has fruity and aromatic notes – and we especially love the delicious, warming aftertaste. Everyone needs a little reward now and then, so why not indulge into one of our new flavours? Zingy orange and crispy waffle woven into delicious milk chocolate. This melt-in-the-mouth creamy milk chocolate has been given that extra crunch! Vibrant, slightly salted pieces of roasted pistachio have been added to create the perfect balance between silky sweet and subtly savoury.